P S Verma & V K Aggarwal (biology) Solutions for Class 9 Science Chapter 6 Natural Resources are provided here with simple step-by-step explanations. These solutions for Natural Resources are extremely popular among class 9 students for Science Natural Resources Solutions come handy for quickly completing your homework and preparing for exams. All questions and answers from the P S Verma & V K Aggarwal (biology) Book of class 9 Science Chapter 6 are provided here for you for free. You will also love the ad-free experience on Meritnation’s P S Verma & V K Aggarwal (biology) Solutions. All P S Verma & V K Aggarwal (biology) Solutions for class 9 Science are prepared by experts and are 100% accurate. 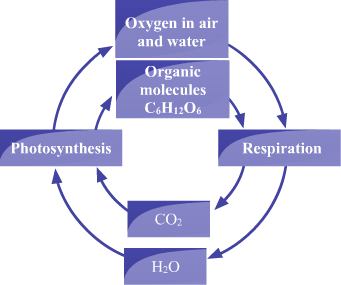 Oxygen and carbon dioxide remain nearly constant in the atmosphere by the processes of photosynthesis (in plants) and respiration (in animals), respectively. By the process of photosynthesis, green plants consume carbon dioxide and release oxygen. This released oxygen is consumed by animals by the process of respiration, in which they release carbon dioxide. The average temperature of the Earth is maintained fairly steady by the atmosphere. It prevents a sudden increase in temperature during daytime and slows down the escape of heat into the outer space at night. It also acts as a blanket covering the Earth. Winds are produced by the movement of air from one region to another. During daytime, cooler air from the sea moves towards the land; whereas during night, cool air from the land moves towards the sea. Take two beakers and fill them with water and sand, respectively. Take a closed bottle and place a thermometer in it. Keep these three in sunlight for three hours. Now, measure the temperatures of the three containers. You will observe that the temperature of water is less than the temperature of sand, as sand gets heated by the sun faster than water. Also, the temperature of air in the closed bottle will be higher than the normal temperature of air in open because of the greenhouse effect. Also, measure the temperature in shade, as temperature in direct sunlight will not be uniform. Place a candle in a beaker and light it. Now, light an incense stick and bring it to the edge of the mouth of the beaker. Observe the direction of flow of smoke. Now, in a similar way, observe the direction of flow of smoke by placing the stick a little above the candle and then at other regions above the beaker. You will observe that the direction of flow of smoke is different in all the situations. The patterns of flow of smoke reveal the directions in which hot and cold air move. Rain is produced by two natural processes, i.e., evaporation and condensation. The water from water bodies evaporates into the air and gets condensed in the form of tiny droplets. Enormous droplets of water appear in the form of clouds. When the droplets become big and heavy, they fall down in the form of rain. Take an empty plastic bottle and put 5‒10 mL water into it. Close the bottle tightly and shake it well. Place it under the sun for 10 minutes. Now, open the bottle and allow some smoke from an incense stick to enter it. Close the bottle tightly. Now, press the bottle with your hands for a few seconds and then release it. Again press it hardly. Observation- When the bottle is placed in the sunlight, the water evaporates and water vapours saturate the air inside the bottle. When the bottle is pressed hard, the internal pressure becomes high and the air inside the bottle moves to a region of low pressure. The smoke particles act as nuclei to condense the water vapours into tiny droplets. When the pressure is released, the air inside the bottle becomes foggy; and when pressure is again applied, fog disappears. This occurs because the smoke particles of the incense stick act as nuclei for the water vapours to condense into droplets. Sulphur dioxide, nitrogen oxide, carbon monoxide, hydrogen sulphide, hydrogen cyanides, hydrogen fluorides, chlorine, methane and ammonia. Pollutant vapours include unburnt hydrocarbons (benzene). The rain with elevated concentration of sulphuric acid is known as acid rain. When SO2 reacts with water in the atmosphere, it forms sulphuric acid, which washes the soil by rain. It is a disastrous effect of air pollution. It severely affects plant growth and salmon reproduction. It destroys buildings by eroding the stone and brick work. Smog is a photochemical haze or smoky mist caused by the action of solar UV radiation on the atmosphere, which is polluted by primary pollutants. Secondary pollutants such as formaldehyde, aldehydes and peroxyacetyl nitrate(PAN) collectively form smog. (ii) It is highly suffocating and toxic. (i) Suspended particulate matter in air causes asthma, bronchitis and allergic cold. (ii) Air pollutants cause irritation in the eyes, throat and lungs. (iii) Hydrocarbon vapours cause cancer. During daytime, the cool air flows from the sea towards the land, because at this time, the land gets heated faster than the water. It generates a low-pressure area above the land as compared to air over the sea. Hence, the air from high-pressure area moves towards the low-pressure area. During night, cool air from the land flows back to the sea because the land gets cooled down rapidly at night and the pressure of air above the land becomes higher then the air above the sea. Hence, there is a reverse flow of air. The Earth's atmosphere acts as a blanket for the Earth. It keeps the average temperature of the Earth steady, prevents the sudden increase in temperature during daylight hours and slows down the escape of heat into the outer space at night. (i) Troposphere: It is the lowest layer that contains air and that extends up to 8‒20 km from the Earth. (ii) Stratosphere: It is the second layer of atmosphere that extends up to 50 km from the Earth. (iii) Mesosphere: It is the third layer of atmosphere that lies above the stratosphere. (iv) Thermosphere: It is the fourth layer of atmosphere that extends up to 100‒120 km from the Earth. (v) Exosphere: It is the outermost layer of atmosphere. Natural sources of air pollution include photochemical smog, ionising radiations and biocides and pesticides. Man-made sources of air pollution include industrial pollutants, heavy metals, radioactive elements and automobile exhaust and smoke. Clouds are formed by an enormous collection of tiny droplets that are formed by the condensation of water vapours in the air. Water vapours are condensed when dust and other suspended particles of the air act as a nucleus for them. These particles condense the vapours into tiny water droplets. The heating up of the atmosphere because of the greenhouse gases (carbon dioxide and methane) that trap the heat reflected by the Earth, thereby causing an increase in the Earth's temperature, is called global warming or greenhouse effect. (i) It causes change in the weather and precipitation patterns on the Earth. (ii) It leads to an increase in methane concentration because of the melting of methane hydrates in polar ice caps and sea floors. Depletion of ozone layer refers to a reduction in the concentration of ozone layer. It is caused by ozone-depleting substances (ODSs) such as chlorofluorocarbons (CFCs), halons, methyl bromide, nitrogen oxides and chlorine. (i) It causes skin cancer due to excess exposure to UV radiation. (ii) It damages the eyes and the immune system. (iii) It affects plants, thereby decreasing crop yields. The rain having an elevated concentration of sulphuric acid is known as acid rain. When SO2 reacts with water in the atmosphere, it forms sulphuric acid, which washes the soil by rain. It is a disastrous effect of air pollution. It severely affects the growth of plants and animals and destroys buildings by eroding their stone and brickwork (e.g., Taj Mahal). It is a technique of collecting, storing, and reutilising rain water. Special water-harvesting structures are made for this purpose such as wells, percolation pits, dams and lagoons. This technique is very useful in the regions where there is water scarcity or where rainfall does not occur. It maintains a supply of water during the dry months of the year. Climate refers to the average weather of an area. It tells us about the general pattern of atmospheric conditions, seasonal variations and weather extremes in a particular region over a long period of time (50‒100 years). Weather is defined as short-term changes in the properties of the troposphere layer of the atmosphere. It changes on a daily basis and tells us about the temperature, humidity, cloudiness, etc., of a place. CFCs refer to chlorofluorocarbons. They are generally used as aerosol propellants, refrigerants, shaving foams, spraying agent in scents, etc. They are very harmful, as they are types of ODS (ozone-depleting substances) that lead to the destruction or depletion of the ozone layer of the atmosphere. Weathering is the process of breaking down of bigger rocks into smaller mineral particles. (i) Physical weathering: It occurs because of climatic factors such as temperature, wind, rain water, ice and snow. (ii) Chemical weathering: It occurs through chemical processes such as hydrolysis, hydration, oxidation and reduction. (iii) Biological weathering: It is carried out by living organisms such as lichens and bryophytes. Soil erosion is a method of removing and transporting the top layer of soil from its original place to some other place under the effect of strong winds and fast running water. (i) Intensive cropping- In this method, soil is totally covered with crops and is not exposed to winds and rains. (ii) Terrace farming- In this method, a large number of flat fields slow down the flow of water. (iii) Contour bunding- Small dikes or bunds are raised on the edges of fields to prevent the loss of soil. Organisms help in soil formation by taking part in the process of weathering. Lichens and bryophytes are involved in biological weathering. Lichens grow on the surface of rocks, creating small cervices by extracting minerals from them. Soil builds up in the thin layer of cervices. Mosses grow on these cervices and deepen the cervices, thereby building up more soil inside them. Cervices get more deepened and form cracks, which become wider and deeper when the roots of the herbs enter them. Water is replenished in sea by rainfall or through run off from ground water that ends up in rivers and ultimately the sea. The water that evaporates from the sea forms clouds. These clouds increase in size and consist of enormous water droplets. When they get big enough, the water is released from them in the form of rain. The process of bio-fixation of nitrogen is called nitrogen fixation. It is usually carried out by industrial nitrogen fixation, i.e., manufacturing of ammonium salts and urea or chemical fertilisers or by nitrogen-fixing bacteria (Azotobacter and Rhizobium). These bacteria convert the atmospheric nitrogen into water-soluble nitrates for the use of plants. Nitrogen is replenished in the atmosphere by the process of denitrification. Decomposers or dentrifying bacteria, such as Pseudomonas, reduce nitrates back to nitrogen or ammonia or some other oxides. Free nitrogen returns to the atmospheric pool, and oxides are taken up by the plants. (i) Combustion, either natural or human-induced, releases carbon in the atmosphere from peat, coal and oil. (ii) Photosynthesis is the process by which plants make their food. They release carbon in the form of carbon dioxide in the atmosphere. 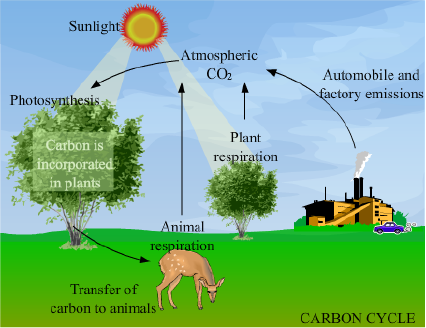 (iii) Respiration by consumers and producers return carbon to the environment in the form of carbon dioxide. (iv) Burning of fossil fuels releases carbon in the atmosphere in the form of carbon monoxide. (v) Decomposition of organic matter by anaerobic bacteria produces methane that contains carbon. (i) It can cause change in the weather and precipitation patterns on the Earth. (ii) It can lead to the melting of polar ice caps and subsequently increase in the sea level, which, in turn, may submerge the cities located along the sea coasts. (iii) It can lead to the melting of methane hydrates in polar ice and on the sea floor, which may increase the methane concentration in the atmosphere (methane burp). The concentration of carbon dioxide in the atmosphere is rising because of the increase in the burning of fuels in homes, industries, automobiles, deforestation, etc. Increase in the concentration of CO2 causes global warming, as it is a greenhouse gas. Ozone layer is called ozone umbrella/shield because it filters harmful, high-energy ultraviolet rays that come from the Sun to the Earth. UV rays split the ozone into molecular and atomic oxygen, thereby liberating the heat that warms the stratosphere. In this way, ozone layer protects the Earth. (i) More UV radiation can pass through it and can lead to rise in the temperature of the Earth. (ii) It may cause skin cancer and damage to the eyes and the immune system in human beings. (iii) It can lead to smog formation, which is highly toxic for plants and animals. It represents the exchange of water between air, land and sea and between the living organisms and the environment. Water evaporates from the hydrosphere (oceans, lakes, rivers seas, ponds) by the heat of the sun and forms clouds. Clouds are carried over to the land by winds. After getting cooled, water in the clouds falls on the earth in the form of rain, sleet and hail. This water again evaporates in the atmosphere and completes the global water cycle. Here, the living organisms, i.e., plants and animals, consume water from the global water cycle and return it back. Plants release water in the form of water vapours by the process of transpiration. Animals return water to the air as vapours by the process of respiration and to the soil in the form of fluid by the process of excretion. Air is called the breath of life because it contains all necessary gases that are required for the survival of life forms on this planet. It is a mixture of gases such as nitrogen, oxygen, argon and carbon dioxide. It also contains water vapour and suspended dust particles. Oxygen gas is required for respiration and burning. (i) It helps in controlling climate by covering the Earth like a blanket and keeps the average temperature of the Earth fairly steady during the entire year. (ii) It creates wind by moving in different directions and helps in warming and cooling the land. (iii) The air carrying water vapour forms clouds when the water vapour condenses around a nucleus of dust and other suspended particles. The cloud formation results in subsequent rainfall. (iv) It forms an ozone layer around the Earth and protects it from the harmful ultraviolet (UV) radiation of the sun. Air pollution can be either natural or man-made. Natural sources include forest fires, dust storms and pollens. Man-made causes are burning of fossil fuels in industries, vehicles and thermoselectric plants, emission of gases from industries, mining, processing and stone crushing. Particulate air pollutants are also known as suspended particulate matter (SPM). SPM consists of smog, soot, fly ash and dust. Gases such as sulphur dioxide, nitrogen oxide, carbon monoxide, hydrogen sulphide, hydrogen cyanides, hydrogen fluorides, chlorine, methane and ammonia also cause air pollution. Unburnt hydrocarbons act as pollutant vapours. (iii) Hydrocarbon vapours cause internal organ damage and cancer. (iv) SO2 reacts with water in the atmosphere to form sulphuric acid, which causes acid rain that washes down the soil and water bodies and deteriorates the growth of plants and certain fishes. (v) Increase in atmospheric CO2 levels intensifies the greenhouse effect and leads to global warming. Ozone is the triatomic form of oxygen; it has a blue colour and a pungent odour. It is highly poisonous to living organisms. The ozone layer refers to that part of the atmosphere that is rich in ozone. This layer is also known as the ozonosphere or the ozone shield. It is a very important layer, as it filters harmful, high-energy ultraviolet radiation coming from the sun. UV rays split the ozone into molecular and atomic oxygen, thereby liberating heat which warms the stratosphere. Depletion of ozone layer refers to reduction in the concentration of ozone layer. It is caused by ozone-depleting substances (ODSs) such as chlorofluorocarbons (CFCs), halons, methyl bromide, nitrogen oxides and chlorine. One of the most important ozone-depleting substance are CFCs, which are rich in chlorine, fluorine and carbon such as carbon tetrachloride and dichlorofluoromethane. (iii) It affects plants by decreasing crop yields. (iv) It leads to a decrease in the population of phytoplanktons, zooplanktons and some fish larvae that form important constituents of the aquatic food chain. (v) It leads to smog formation, which is very toxic for plants and animals. It includes organic wastes contributed by food-processing plants, dairy farms, poultry farms, breweries, tanneries, etc. Animal excreta discharged in fields or dumped into pits reaches water bodies through run off. It includes harmful organic and inorganic chemicals that are released by different industries and effluent mills into water bodies. Houses and some factories discharge water containing soaps and detergents. Tiny suspended soil particles that are carried to water bodies through rain cause turbidity. Hot water discharged from industries and thermal plants into water bodies alters the temperature and reduces the oxygen concentration in water. (i) Water polluted by various pathogens can cause human diseases such as cholera, typhoid, jaundice, dysentery and hepatitis. (ii) Water pollutants disturb the ecological balance of water bodies by promoting the growth of certain life forms that are harmful to other life forms. (iii) Increase in the concentration of organic pollutants causes an increase in the bacterial population, which uses the available oxygen. The lack of oxygen kills fish and other animals. (iv) Discharge of untreated industrial wastes rich in heavy metals, acids and alkalis results in the death of useful microorganisms that contribute to the self-purification process of water bodies. (v) Thermal pollution causes a sudden marked change in the temperature of water bodies that may kill the larvae of various animals and affect the breeding of aquatic animals. It is the process in which there is a decrease in the concentration of dissolved oxygen in water because of excessive growth of algae or increase in the nutrient concentration in the water body. This occurs because of continuous sewage disposal in water body. It also occurs when fertilisers are washed into the water body from the nearby fields. Sewage and fertilisers provide a lot of nutrients to the phytoplanktons in the water body and result in excessive growth of algae, also known as algal bloom. When the algae subsequently die, the aerobic decomposers become active and rapidly consume the dissolved oxygen from the water body during the decomposition of algae. This drastic depletion of oxygen causes the death of the entire aquatic life in the water. Biomagnification is the phenomenon of increase in the concentration of harmful non-biodegradable chemical substances in the body of living organisms at each trophic level of food chain. This occurs because of increase in the concentration of harmful chemicals such as pesticides (DDT, DDE, dieldrin, etc.) and heavy metals (mercury, cadmium, tin, lead, etc.) in the water bodies that cannot be degraded by the microorganisms. It leads to the poisoning of the predatory birds that eats fish such as kingfishers, ospreys and loons. For example, biomagnification of mercury in the fishes through the food chain results in Minamata disease in fish-eating human population. (i) It provides a medium for various life processes that occur inside the bodies of living organisms. (ii) It is consumed by plants by the process of photosynthesis. (iii) It helps in maintaining a constant temperature of the body that may alter because of various metabolic reactions that occur in the body. (iv) It is a universal solvent and can dissolve various particles that enter the body such as salts and sugars. (v) It forms the habitat for all aquatic life forms. (vi) It is one of the key agents in soil formation and serves as the living medium for several different ecosystems. Soil is a part of the earth's surface that contains disintegrated rocks and decaying organic matter. It provides support for the growth of many plants and animals. It is the process of breaking down of bigger rocks into smaller mineral particles. (ii) Chemical weathering: It occurs through chemical processes such as hydrolysis, hydration, oxidation and reduction. The primary end products of chemical weathering are silica, clay, inorganic salts and hydrated oxides. These three processes generate cervices in the rocks that act as places for soil build up. This process involves the decomposition of organic material by bacteria and fungi, thereby leading to humification and mineralisation. Addition of organic matter (humus) is the final stage of soil formation that occurs after the consumption of organic matter by detritivores. A mature soil consist of minerals, organic matter, oxides of nitrogen, ammonium ions, water and air. Soil pollution is referred to the degradation of soil fertility by removal of useful components and addition of other harmful substances. Soil pollution can be caused by solid wastes as well as chemicals. Fly ash, which is a grey powdery residue of unburnt material, is produced by most industrial furnaces and thermal power stations. Fly ash is deposited in the soil and causes pollution. Domestic wastes also add a large amount of solid pollutants to the soil. These include domestic waste and sewage that can easily be decomposed. These include those pollutants that cannot be decomposed such as plastics, inorganic metallic compounds, oxides, pesticides (DDT) and radioactive substances. (i) It makes the soil infertile. (ii) It kills the microorganisms living in the soil. (iii) It affects the crop production. (i) It leads to the loss of soil fertility and desertification. (ii) It causes landslides in hilly areas. (iii) It leads to famines in areas, making them unfit for the cultivation of crops. (iv) Conservation tillage- Herein, reduced or no tillage is practised, which prevents soil erosion. (v) Wind breaks- Rows of trees and shrubs are planted at right angle to the direction of the prevailing wind flow to check erosion by wind. (vi) Drainage canals around field- Excess water is removed through small drainage canals built around the field. (vii) Strong embankments along river banks- Strong embankments made of stones or sand bags along the sides of a river check soil erosion by fast-moving river water. It is the process that occurs in nature to maintain the nitrogen concentration in the atmosphere, soil and water. Free atmospheric nitrogen is chemically inert and cannot be used in pure form by organisms. Hence, it is first converted into nitrates, which can be assimilated by plants. This conversion is carried out by industrial nitrogen fixation (by the manufacturing of ammonium salts or chemical fertilisers) or by nitrogen-fixing bacteria such as Azotobacter and Rhizobium. This conversion is called bio-fixation of nitrogen or nitrogen fixation. The nitrates are absorbed by plants and utilised by them for making organic matter. Animals consume plant matter and break down the nitrogenous compounds of plants during their cell activities. Urea or uric acid excreted by animals and the nitrogenous compounds present in the dead plant matter are converted to ammonium ions by the process of ammonification. Ammonification is carried out by certain putrefying bacteria and fungi. Plants assimilate this ammonium ions or certain bacteria and convert them into nitrate through nitrification. Microorganisms like Nitrosomonas and Nitrobacter convert ammonia into nitrates by the process of nitrification. Decomposers such as Pseudomonas reduce nitrates back into nitrogen or ammonia or some other oxides by the process of denitrification and release free nitrogen back to the atmospheric pool. Decomposers such as bacteria, fungi and actinomycetes play an important role in the cycling of materials. They decompose the detritus (dead or partially decomposed animal or plant matter) so that the nutrients get stored in the soil to be utilised again by plants and animals. These absorbed nutrients are metabolically incorporated in plants during their growth. Decomposers act on the litter of vegetation, animal remains, faecal matter of animals (above ground detritus) and dead plant roots (below ground detritus), recycle the nutrients from them and return them to the soil. Dentrifying bacteria like Pseudomonas are decomposers involved in the conversion of nitrates to free nitrogen gas or ammonia to some other oxide.The free nitrogen returns to the atmospheric pool, whereas the oxides are assimilated by the plants. Decomposers also play a major role in the carbon cycle, where carbon accumulated in wood is returned to the atmosphere through consumption and respiration by fungi, bacteria and other detritivores. Various anaerobic methanogenic bacteria present in freshwater wetlands, rice paddies and digestive tract of ruminants decompose organic matter to produce methane. Methane is a major component of natural gas and has the potential to increase global warming. Nutrients are supplied to the ecosystem via external resources for further use in biological processes. Nutrients move out of the ecosystem, and some nutrients become inputs for another ecosystem. Decomposers such as bacteria, fungi and actinomycetes continuously regenerate nutrients in the soil by the process of decomposition and store them in the forms that are available to plants. Here, the living organisms, i.e., plants and animals, consume water from and return it to the global water cycle. Plants take up water from the soil or water reservoir and release it back in the form of water vapours by the process of transpiration. Animals take water from water reservoir or with food and return it to the air as vapours by respiration and to the soil in the form of fluid by excretion. Dead and decayed organisms also add water to the environment. Water vapours formed by transpiration and respiration form clouds and enter the global water cycle. Water returns to the soil and reservoir in the form of rain to be reused. This completes the water cycle.